Garrett Leight / A. Kinney Court: Back to School for Kids! - Yo! Venice! Home Abbot Kinney Blvd Garrett Leight / A. Kinney Court: Back to School for Kids! Garrett Leight / A. Kinney Court: Back to School for Kids! 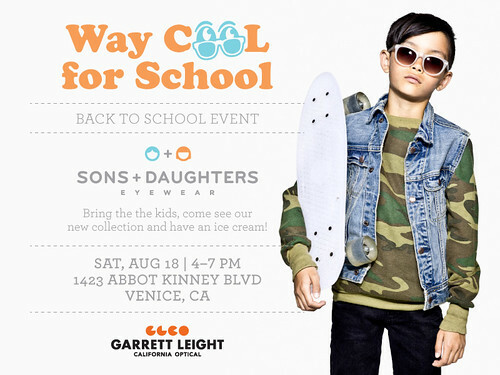 Garrett Leight / A. Kinney Court will host a back to school event featuring kids eyewear designer “Sons + Daughters” tomorrow afternoon from 4-7pm. Sons + Daughters is a Canadian based company that focuses on glasses for the 2-12 year old set. At $60 per frame, Sons and Daughters are durable and stylish yet child safe! Some of the frames will be on sale! An ice cream truck will be out front giving out free ice cream to all the kids that stop by, and the Garrett Leight California Optics will also be on display for the adults!